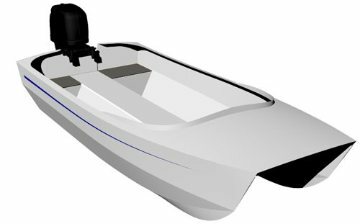 This design is of good size and is well suited as a tender for a larger cruising vessel. It can comfortably carry 5 adults and gear. The 3.2m Ripple design has extra length and freeboard to deal with choppy conditions. It will be ideal for day trips where additional carrying capacity is required and extra comfort for longer periods. Performance will not disappoint with excellent planing speeds and also ferrying slower speeds.